This week we have added 4 kiddos to our China Waiting Child photo listing! These kids are all considered Special Focus, meaning families can be matched with them at any point in the process. If you’re interested in learning how you can be matched with Kiera, Daisy, Chloe or Lucas, visit our photo listing or contact our China matching specialists to review their files today! 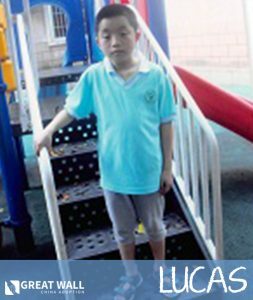 Click here to view our China Waiting Child photo listing! This sweet girl is Kiera! She 13 years old and will be aging out this May. 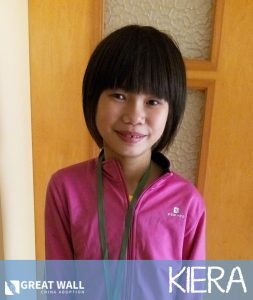 She is an amazing kiddo in need of a forever family! Her file states that she had intracranial hemorrhaging, but she has had surgery and is doing great. She lacks some mobility in her left hand, but other than that her mobility is fantastic. She loves to run, jump, and play with her friends! She has excellent verbal communication and is even taking English classes! Her caretakers mention that she is not delayed on her cognitive skills and is on target compared to her peers. She is a sweet girl who would thrive with a forever home! Please reach out if you would like to learn more! Daisy is a sweet little girl who is 2 and a half years old. 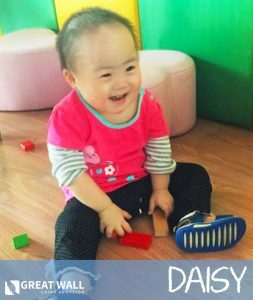 Daisy has Down Syndrome and is said to be doing better cognitively than her peers who have Down Syndrome in her orphanage. Daisy can walk and go up and down stairs by herself. Daisy is babbling and can say some names of familiar people like her caretakers. Daisy can put on and take off her shoes by herself. Daisy tends be more of an introverted child, but she gets along well with other children and familiar people. Daisy does not have any heart issues. You can contact the China Home Finding Team at Great Wall if you would like to learn more about adopting Daisy. We hope we are able to find Daisy her Forever Family soon! Video #1! | Video #2! | Video #3! Chloe is a cutie who just turned 2 years old! She was born with CHD and she has some differences of her hands and feet. GWCA is currently trying to get more information to see if she has additional needs. Presently she can walk with some support, she can hold food and blocks in her hands and pass items between her hands. Her file indicates that the function of her right hand is slightly better than her left. She is observant and can recognize familiar caretakers. She is described as being introverted but she loves to play with someone’s company. 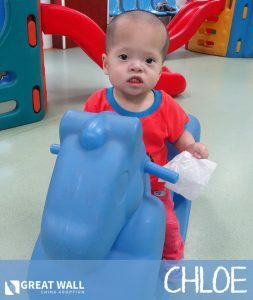 Chloe loves watching cartoons, playing with toys and observing her surroundings. Contact one of our matching specialists today if you’d like to learn more about her! Lucas is a sweet boy who is 7 years old! He is developmentally delayed when compared to his peers. 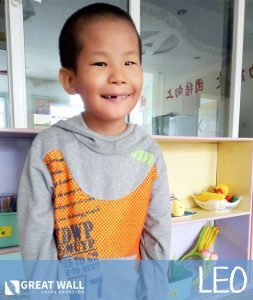 Lucas is described as a polite kiddo who listens carefully to his caretakers and teachers. He is inquisitive and always likes to learn about new things. Lucas is always helping his caretakers with simple tasks and with the younger children. He is considered to be chatty but his language development is delayed compared to children his age. Lucas’ file is pretty limited so GWCA is currently trying to gather some more information. Contact one of our matching specialists if you’d like to learn more about him!